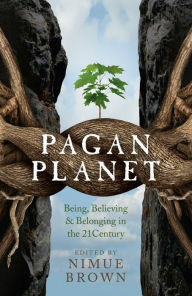 Pagan Planet: Being, Believing, and Belonging in the 21st Century, edited by Nimue Brown, is a collection of essays by many different authors. Most of the essays are fairly short, but there are a lot of them. The authors are from different traditions, and their essays are on different topics. The book is published by Moon Books. Rather than try to present the full scope of this varied book, I’m going to pick just a few of the essays to look at closely. I’ll examine the lead essay, two essays on topics I know a lot about myself, and the essay by the volume’s editor. For the essays on topics I feel that I can write about with some authority, I chose the one essay that mentions heathenry in the title, and the one essay that mentions Tolkien in the title, as those are both topics on which I consider myself an expert. The first essay is “PaganAid and the Road to Social Justice,” by Ian Chandler, founder of PaganAid. Chandler’s experiences in Zimbabwe led him to advocate for sustainable agriculture, which respects local conditions and traditions. He saw that encouraging arid-lands farmers to adopt modern high-input agriculture only led to debt and worse poverty. He concluded that environmental issues and human rights issues had to be solved together, not as opposing forces. Chandler links his values to his Druid faith as an expression of love for both people and for the earth. Heathens are represented in the essay by Pete Jennings. He has been heathen since the days when it was hard to buy heathen and pagan books. He is in the UK, so not all his experiences are representative of the experiences of heathens in the USA like me. I was startled to find in his essay that UK heathen and pagan prison chaplains are paid by the government. However, I really nodded my head when he wrote about the difference the internet made. His heathen faith led him to change his occupation from sales to social work, to develop an interest in the hobby of historical re-enactment, and to support environmental causes. In “Working with Tolkien,” by Calantirniel, I expected to read a narrative much like my own path. I’m a huge Tolkien fan, and it was probably my introduction to runes, elves and dwarves, and Gandalf at age five in Tolkien’s books that led to my recognizing runes, elves, and the Odinnic wanderer in nonfiction later and thus, led to my becoming heathen. I was surprised when this essay led instead with the author wanting a church-free relationship with Christ. Calantirniel is working with Tolkien’s subcreated mythology, Pop Culture Pagan style. The author considers that a worldview that is compatible with a Christopagan practice. The essay by the editor, Nimue Brown, is buried in the middle of the second half of the book. She has chosen not to showcase her own contribution, but to present it as an ordinary part of the collection. Unlike many editors of essay collections, Brown is not the initiator of this project. In her essay, she writes of her personal experience of the change over time in the pagan community. There is greater acceptance of pagans by the wider community, which has led to less secrecy and isolation among pagans. There is also increasing environmental activism. This book is written as autobiography, and thus, is aimed at the general reader but could also be of interest to the academic reader. It’s full of surprises, and even someone who has been around the pagan and heathen communities for a long time can learn a lot from it. Everyone has their own unique path and their own unique voice. I recommend this book for anyone who wants to know about other pagan traditions and how other pagans apply their faith to the modern world.